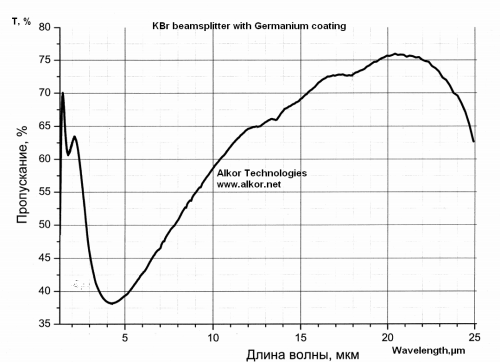 IR beamsplitters: KBr beamsplitters with Ge coating, CaF2, ZnSe beamsplitters. Beamsplitter coating designed for separating the incident light beam reflected and transmitted with a predetermined intensity ratio . 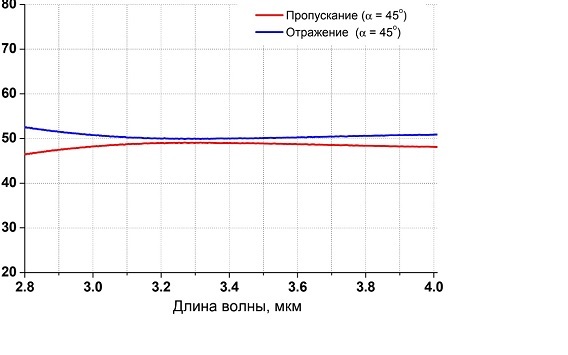 Generally the angle of incidence of light on the beam-splitting coating surface varies from 0° to 45°. Beamsplitter coatings are applied in a wide region of the spectrum from 200 nm to 20µm for different angles of incidence. Typically the standard beamsplitter coatings are designed for wavelengths of 532 nm, 633 nm, 780nm, 1060nm and 1550nm. Moisture protective coating (Parylene analog) can be applied on beamsplitter and compensator upon request. We can produce custom shape Germanium coating - it could be very useful for adjusting optics in visible spectrum. All KBr beamsplitters carefully packaged into plastic boxes with silicagel and sealed with special moisture protective film. Also we offer plate and cube beamsplitters for unpolarized, polarized P or polarized S light. These beamsplitters are coated with special dielectric coatings that transmit a specified percentage and reflect the balance of incoming light. The most common beamsplitter ratio is 50/50 but we offer a variety of beamsplitter ratios for various wavelengths. Our Si beamsplitter offering excelent perfomance in 2-8 microns range. The CVD laser quality ZnSe beamsplitter provides a 50/50 ratio from 7 to 14microns. Other substrates for beamsplitter coating - Fused Silica, BK7, NaCl, KCl - works in visible or infrared. Ask our sales team for specifications! We are experts in beamsplitters for more than 20 years. Our beamsplitters are widely used in spectrometers for petrolium testing, fuel testing, mining industry and many application all over the world.